As I write this, I'm nervously watching weather reports as Cat 5 Hurricane Irma seems to have her eye set on my hometown of Miami, Florida. This thing looks dangerous and I'm praying we will survive. 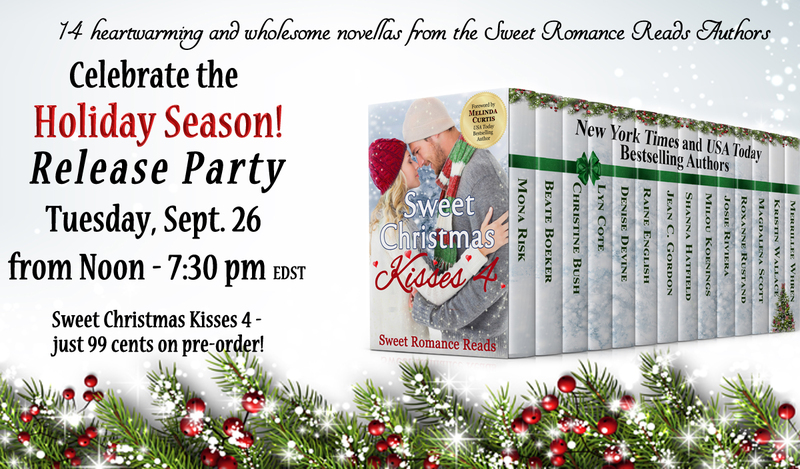 BUT I do have something to distract me and that is the upcoming release of Sweet Christmas Kisses 4. I’m very excited to give you a preview of my contribution to this year’s holiday box set. 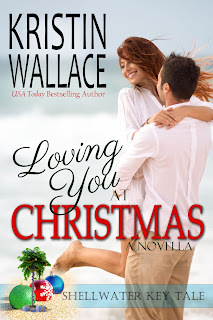 My novella is Loving You At Christmas and it is the final book in my Shellwater Key Tales series. I actually thought I was finished with the series after the release of my last book (Last Stop At Paradise), but then I realized I needed a Christmas novella for the box set. I also realized I had another character who really needed a happy ending. Annaliese Matheson is a former Broadway star who first appeared in Book 1 of the series, Left Turn At Paradise. She suffered a tragic loss that drove her from the theatre, but fate is about to shake up everything. I’ve paired her with a super hot guy that think you will love. Annaliese Matheson once had the perfect life, with a successful career on Broadway and a loving husband who was her greatest champion. Then her husband died. Devastated, she left the stage behind and only returned when her best friend, Grayson Kendall, asked her to perform at The Paradise Dinner Theatre in tiny Shellwater Key, Florida. Annaliese is convinced she’ll never love again, but when she steps in to direct to Middle School Christmas Show, nothing will ever be the same. A man unlike any she’s known awakens her buried heart, giving her a second chance at forever with the last person she would have expected. It will take a miracle for Annaliese to let someone else in and embrace happiness again...but then it is Christmas. Annaliese Matheson thought there was no better way to spend a Sunday afternoon than jogging around Gulfview Park. Especially since it was almost December and the temperature and humidity in the tiny Southwest Florida town of Shellwater Key had finally dropped so it didn’t feel like she was sucking in a soggy dishcloth with every breath. Her muscles pulled and flexed as she rounded the corner and hit the stretch of path running parallel to the beach. A swath of powdery, white sand led to the Gulf of Mexico, which spread to the horizon like an aquamarine curtain, undulating to a rhythm established long before she’d ever graced this earth. It was a sight that never failed to inspire awe. Movement to the right caught her attention, and she turned from the beautiful view to one that was decidedly more masculine. The football brigade had arrived. The group of men came to the park every Sunday, though their numbers ranged from seven to as many as sixteen on a good week. Those weeks were excellent, in her opinion, as the chances of better eye candy greatly increased. The sudden fascination surprised her, since Annaliese had never been into sports. In high school, she’d never sighed over the star athletes like the other girls. Those guys had been sweaty, rude, overbearing brutes with serious God complexes for the most part. The men of the football brigade were just an ordinary group of guys who got together to play every week. She liked to imagine they were old friends, now grown-up husbands and fathers, seeking a release from the everyday stresses of life. Some were in pretty good shape, while others had let things go a little more. A few of them were drool- worthy, though. Especially one in particular… Alpha Man. Annaliese thought of him as their leader, though he actually never played. For some reason, Alpha Man always stood on the sidelines, occasionally throwing out pointers or ribbing the guys over a dropped pass or missed tackle. Alpha Man stood out for another reason, of course. He was quite possibly the most beautiful man she’d ever seen. Annaliese had been around a lot of good-looking men in her life. She’d hung out with actors who could make synapses misfire from a single smile, but Alpha Man was…delicious. He was extremely tall, towering over the other men by several inches, and built like a brick wall. His shoulders would have made Atlas weak with envy. Then there was the military-style dark hair that emphasized the perfect cut of his cheekbones. She’d never been close enough to see the color of his eyes, but her imagination filled in some pretty spectacular blanks. Annaliese had never seen anyone like Alpha Man before. He was virile, commanding, and fueled with so much testosterone, it was a wonder the grass didn’t catch fire due to the sheer force of his masculinity. Manliness like that had never really been part of her universe. Even the beautiful actors tended to be shorter and built along slimmer lines, and the Broadway men were another breed of fish in the sea altogether. Alpha Man didn’t always make it to the Sunday afternoon games, but when he did attend, the atmosphere changed. The guys became much more serious and competitive. They played for real, almost as if the others were trying to impress him. Of course, Annaliese did not choose to run in the park on Sundays just so she could get a glimpse of Alpha Man. She’d never go for someone like him in real life. Still, she could look and enjoy a fantasy or two. She could remember what it was like to be a woman, just for a while. By now she’d made it back around toward the beach. The guys had chosen to play closer to this end of the park, so Annaliese had a marvelous view of Alpha Man’s superior backside. Close enough that her heart began to race and her skin heated. The primordial reaction caught her off guard, and she forced herself to look away from the temptation. Instead, she focused on the shoreline. Thankfully, the view was the perfect distraction. So was the amazing weather. In her previous life, she’d already be buffeted by icy winds whistling down the steel canyons of Manhattan as she raced to a theatre for the Sunday matinee performance. Of course, nothing about her life back then resembled anything in the current version. Broadway was long behind her, as was the man who’d shared every dizzying high and jolting low of her career. His image filled her mind, the short, rangy body she’d explored every night. The soft, overlong brown hair she’d spent a lifetime running her hands through. The smooth, baritone voice that used to make her weep. His serious, dark eyes that had once gazed at her with absolute adoration. Those same eyes growing dim and blank…lifeless. A silent curse reverberated through Annaliese’s mind, and the muscles in her chest constricted, cutting off her air supply. Black dots swam in her vision, and she bent over, sucking as much oxygen as she could into her deprived lungs. Crap…crap…crap! How could she still be reacting this way after three years? The deep, gruff voice had Annaliese spinning around in surprise. A shocked gasp lodged in her throat as she looked up…and up…and up some more. Only, now he was a couple feet away instead of across the field. Green. His eyes were green. A light shade, almost the same color as an old glass soda bottle, shot through with little bits of molten gold, and framed by lashes that were indecently dark and thick. It almost didn’t seem fair that his eyes were so arresting when the rest of him was spectacular. He should have a squint or lazy eye…something to distract from the sheer perfection of the rest of him. From far away he’d seemed impressive, but up close, he was a hundred times more potent. His face was a work of art, all angles and blunt lines. Hard, except for those ridiculously feminine eyelashes and surprisingly full lips. Plus, he towered over her, making her feel like a Lilliputian. A delicate flower ready to sway at his feet, felled by the sheer force of elemental, masculine beauty. Annaliese blinked, snapping out of her trance. She must be losing her mind. Either that or she’d been deprived of male companionship for too long. “Ma’am?” His question was a little more urgent this time. He stepped closer and raised a hand like he was going to take her pulse or check for a fever. The thought of Alpha Man touching her made Annaliese jump back. No way could she handle having his hands on her right now. There was no telling how she might react to physical contact. As opposed to now, when I probably look like I want to jump you? “Uh huh.” He didn’t look like he believed her. “It’s Thanksgiving this week,” she said, by way of an explanation. “Is that a new Thanksgiving tradition? Run till you collapse?” The question was dry as a desert, and darn, Annaliese liked a man who spoke fluent sarcasm. He hadn’t moved anything except his eyes, but Annaliese felt the heated caress to her very core. “Have you been to a show at The Paradise?” He didn’t strike her as someone who attended musical theatre. Male panic flooded his gaze, like he’d just been told to buy feminine products for his wife. The wild look gave his answer, though Annaliese already knew he hadn’t ever graced the halls of The Paradise. She would have remembered seeing him. He was not a man anyone could overlook. “It’s not exactly my thing,” he said. It was so like a man to dismiss something as girly just because it didn’t involve punching, hitting, running, or tackling. “Of course, standing on the sidelines, not playing football is much more manly,” Annaliese said, letting her sarcastic flag fly, too. “Because you’d embarrass them with your lack of…abilities?” she asked, letting her own gaze drift lower. Daughters? That must mean there had to be a wife. Knowing there was a woman and children waiting at home for him sent a dart of disappointment through her. Though, why did it matter if he was married? Men like him always had a woman. It wasn’t like she cared if he was already taken. He was a stranger…and he’d remain one. “Well, I should get back to my run,” Annaliese said. Annaliese spun on her heel and walked a few feet before kicking it into a light jog. She knew Alpha Man was still watching her. She could feel the burn of his green-eyed gaze at her back. So, if she let her stride lengthen a little more and her back flex to a perfect arch, to give him a better view, there was no harm, right? He was married…with four daughters…totally off limits. Totally not her type. And she totally didn’t care. 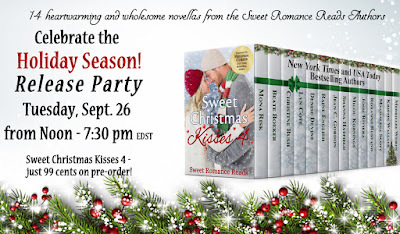 You can pre-order Sweet Christmas Kisses 4 for only 99 cents and have it delivered to your reader on September 26th. Plus, join us for the Facebook Launch Party on Tuesday, September 26th for giveaways, prizes, games & a chance to meet all the authors! Download a FREE book! Sign up for my newsletter and get a FREE Shellwater Key Tale. Click here to download! Such a great first chapter, Kristin! And, please stay safe.